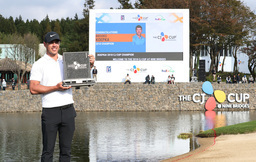 JEJU ISLAND, South Korea (AP) Brooks Koepka is golf's new No. 1 after winning the CJ Cup at Nine Bridges on Sunday by four strokes. Koepka, who displaced Dustin Johnson for the world's top ranking, shot a final-round 8-under 64 for a 21-under total of 267. Koepka, who had never held the top ranking, led by four strokes after three rounds. "To be No. 1 is something I've dreamed of as a kid," Koepka said. "I don't think this one is going to sink in." "I'm not somebody who's going to panic if things go the wrong way," Koepka said of his slow start. "I felt like the one at 15 was quite big with Gary making a charge." "Brooks with the lead.not much fazes him," Woodland said. "So you knew you had to make a lot of birdies and I made a lot today. I was trying to put as much pressure as I could. But just shows I was too far back to start after not making too many putts yesterday. I gave myself a chance, I was tied for the lead there. Brooks obviously just made some clutch shots down the stretch." "The more I made, the more free I felt in my swing and I was able to hit some close," Palmer said. "I made some long putts coming down the stretch. Actually on 17, I looked at my scorecard, I was like, `oh, that's six in a row.' It is kind of back there, but you don't think about it. What a special day." It was Koepka's 12th victory worldwide, including four wins on the European Challenge Tour. He now has won in six countries - the U.S., South Korea, Spain, Italy, Turkey and Scotland. "Everything I've done this year it's been working. So I don't want to change anything," Koepka said. "Just keep improving. "I'm so excited right now, you have no idea. I can't wait to go play again." He'll get his chance soon. Next week the PGA Tour heads to Shanghai for the final stop on its Asian swing, the World Golf Championships-HSBC Champions.